On November 2nd 2011 I saw Craig Campbell live at the Ricoh Arena in Coventry. Here is my review. Having already supported the likes of Rich Hall and Frankie Boyle this Canadian comedian is now embarking on his own solo UK tour. On the night it was a fairly small audience – at a guess perhaps 200 people – in the Legends Lounge at the Ricoh Arena. Intimate comedy, always the best, much better then these huge NIA gigs you get! Beforehand I’d seen him described as a ‘Canadian Billy Connolly’ and I can totally see why, he has a similar eccentric personality and also has a similar storytelling style of comedy. He came bounding out dressed in typical shorts and sports t-shirts, on arriving at the stage he glares with his beady eyes and brushes his long hair and beard, I think a few cheeks sucked in tight at that moment thinking “there’s a nutter on the stage”, and indeed their was, Craig Campbell. The gig began with a bit of light audience interaction, the usual asking peoples names and what they do. A solid start, which certainly served to make a few people nervous! All good fun. Then he moved on to begin his story’s, he likes to tell story’s, but not long drawn-out ones, and they are intertwined with gags. The topics surrounded heavily on his experiences and views towards Britain, as a Canadian who has now lived here for over 10 years. Some excellent observational humour. The first part of the show lasted an hour, then a short interval for beer top-ups, before cracking on with the second half. It started at 8, and finished at nearly 11, a good nights entertainment. I don’t want to put any spoilers here but he ended the night well with a big joke (as all comedians should!) which seemed to go down incredibly well and probably got the biggest laughs of the night. We bought our tickets on the night for only £8, for well over 2 hours of quality stand-up comedy, this is cracking value for money. I’m not sure what prices at other venues will be but they shouldn’t be far off that, in all honesty I’d have happily paid more for the ticket. He will be all over Britain, including a couple of London dates, you can check his tour dates on the Ents24 website. Well worth going to see. 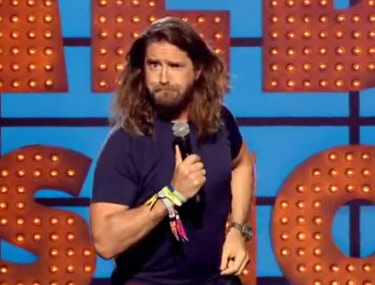 Image used as a category thumbnail is a screenshot from his appearance on Comedy Roadshow. See it below.